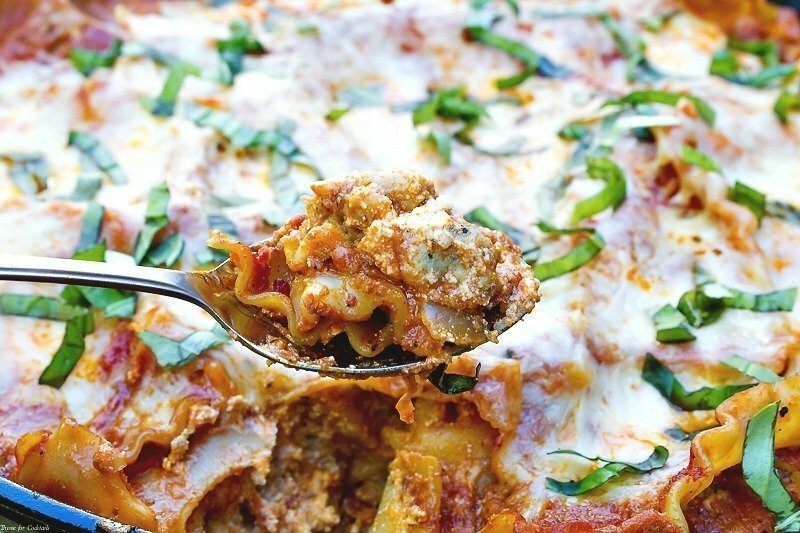 This is Chicken-Basil Sausage Lasagna Skillet is the answer to your weeknight dinner dilemma! Savory chicken sausage packed full of fragrant basil is layered with creamy ricotta cheese, tender lasagna noodles, melty mozzarella cheese and a rich marinara sauce. This week has really gotten away from me. Paul is wrapping up things for his sub-contracting company and has been all over the place, the kid is working extra hours to pay for prom next month and things are picking up around the casa kitchen. 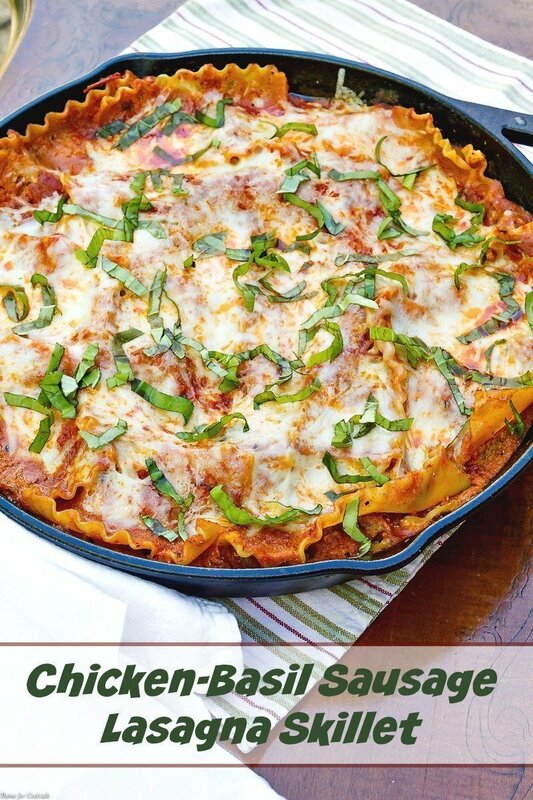 [bctt tweet=”Chicken Basil Sausage Lasagna Skillet #comfortfood #Italian #pasta #hungry”] I looked at the calendar today and realized we only have one more week in March! Wasn’t it just Christmas? It’s a bit disheartening how quickly the year is flying by, but the gorgeous spring weather warms my heart along with my shoulders. The birds and bees may know it is time for new beginnings, but my stomach is still craving cool weather comfort food. In a few more weeks it will 100+ degrees, and will stay that way until October. Not the idea environment for classic dishes like lasagna. Enter this Chicken-Basil Sausage Lasagna Skillet with all the flavors of your favorite traditional dish, but without the hassle of running your oven. 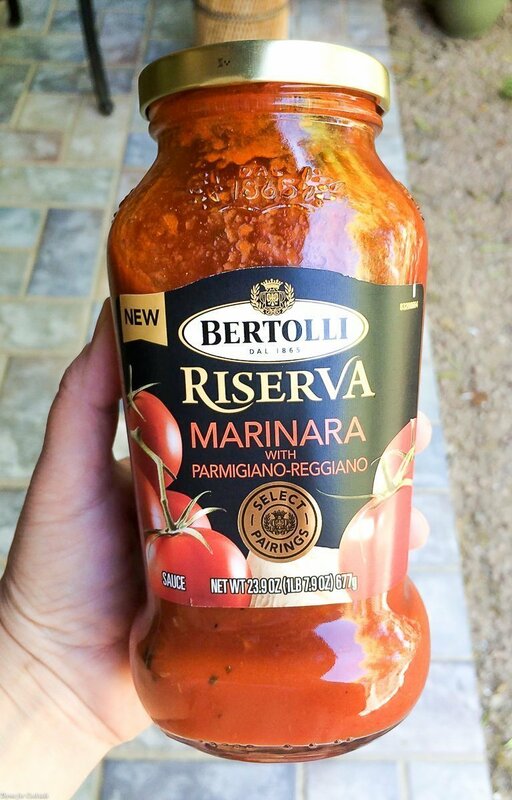 And the quality you find in Bertolli® Riserva Marinara with Parmigiano-Reggiano Sauce. It has hearty, choice tomatoes balanced with sharp Parmigiano-Reggiano cheese to bring out a distinctive marinara flavor that goes perfectly in this recipe. Onions and yellow bell peppers from the this week’s farmers market trip round it out. And the basil is from my patio garden! It is still a BIG work in progress but some of the herbs are already getting their groove! 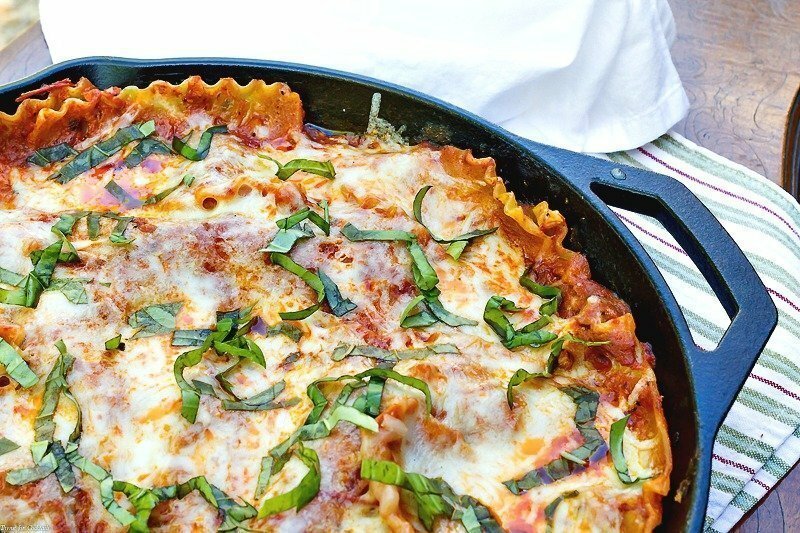 This is Chicken Basil Sausage Lasagna Skillet is the answer to your weeknight dinner dilemma! Savory chicken sausage packed full of fragrant basil is layered with creamy ricotta cheese between tender lasagna noodles and smothered in a rich marinara sauce. Heat a 12 inch cast iron or non-stick skillet over medium heat. Add onion, bell pepper and garlic, cook 2-3 minutes. Add chicken sausage and break up. Cook 3-4 minutes, stirring occasionally. Remove half of meat mixture and place in a bowl, set aside. Stir in 1 cup marinara sauce. Drop half of ricotta over sauce in even spoonfuls. Sprinkle with half of parmesan cheese. Cover with half of noodle pieces. Repeat layer with sausage, sauce, ricotta, parmesan and noodles. Add 1/2 cup water to remaining marinara, shake closed jar to combine. Pour sauce evenly over top of lasagna. Bring to a low boil, cover and reduce to low. Simmer 20-25 minutes until noodles are tender. Sprinkle mozzarella cheese over top, let rest 5 minutes to set. Sprinkle with basil and serve warm.